A fish to die for!! I ordered fish as a main course. 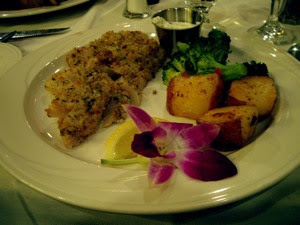 This white fish had been coated with breadcrumbs, and fried until light brown and crispy. It was served with potatoes and broccoli, and with a small cup of herb butter. Perfect late night dining, and presented with a small orchid!